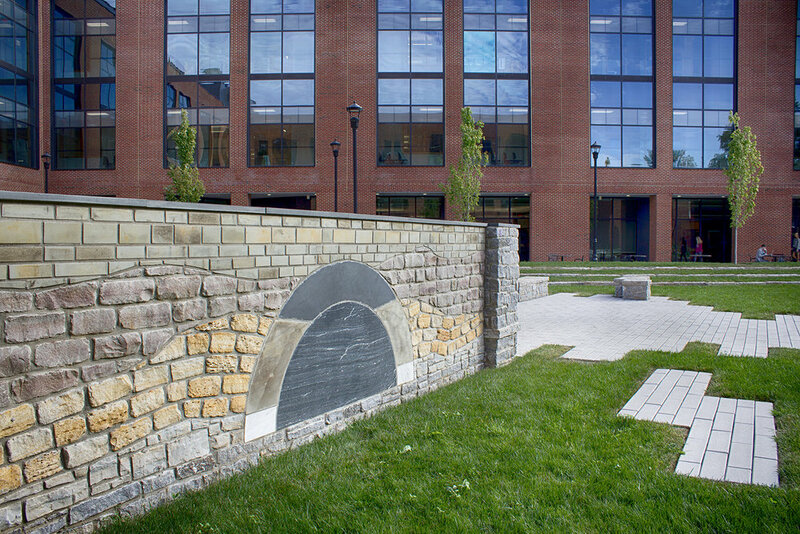 Finished courtyard view shows sweeping native landscape and outdoor classroom walls with patterns that are symbolic of Kentucky natural waterways and geologic formations. 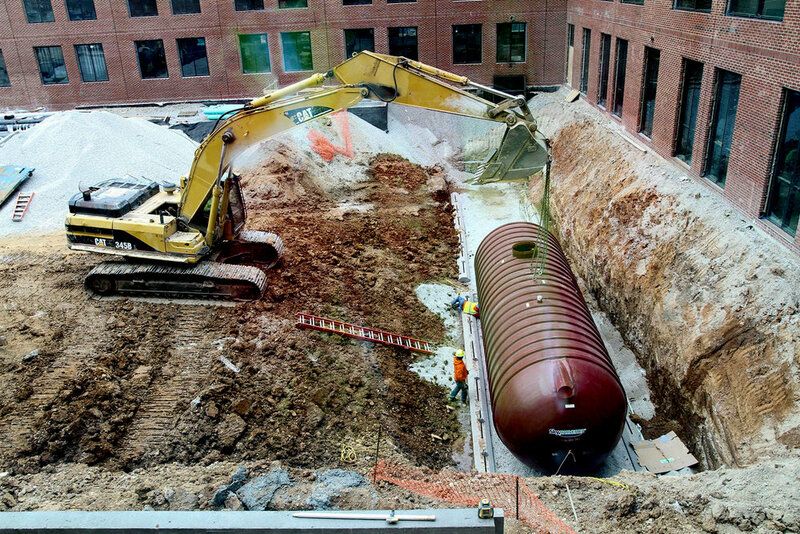 First of two 10' diameter 20,000 gallon water harvesting tanks installed 10' from building in courtyard. Remaining courtyard area devoted to stone detention basin below grade. 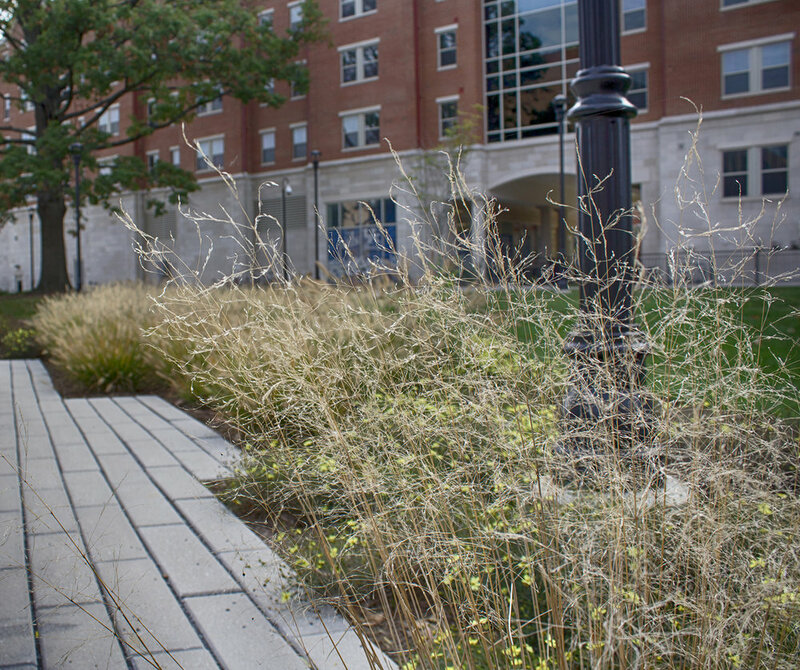 Landscape berm with terraced seat walls create separation between cafe and pedestrian corridor from outdoor classroom areas. Outdoor classroom space with geologic seat walls and chalkboard slate wall. Permeable pavement infiltrates to subsurface detention basin for rainwater harvesting system. A classroom seat wall displays a geologic slip fault. 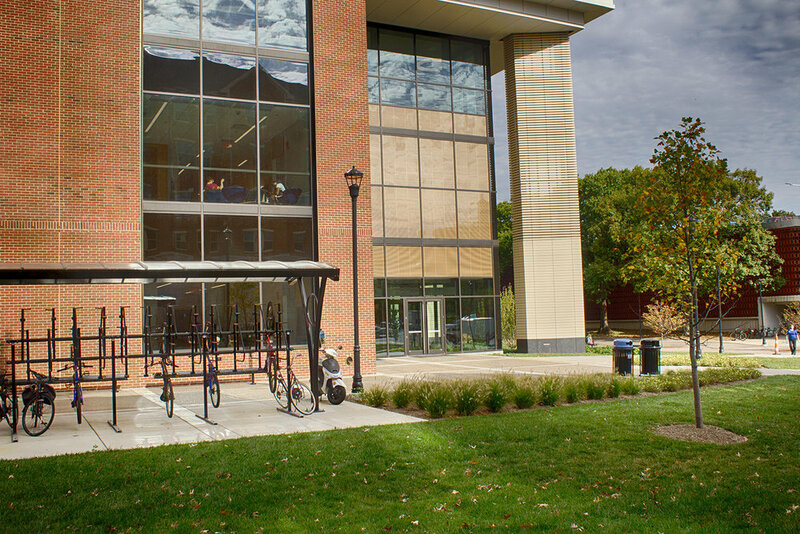 Canopy covered bike hub adjacent to Hilltop Avenue corridor encourages students, faculty, and staff to ride to class and avoid use of vehicle. 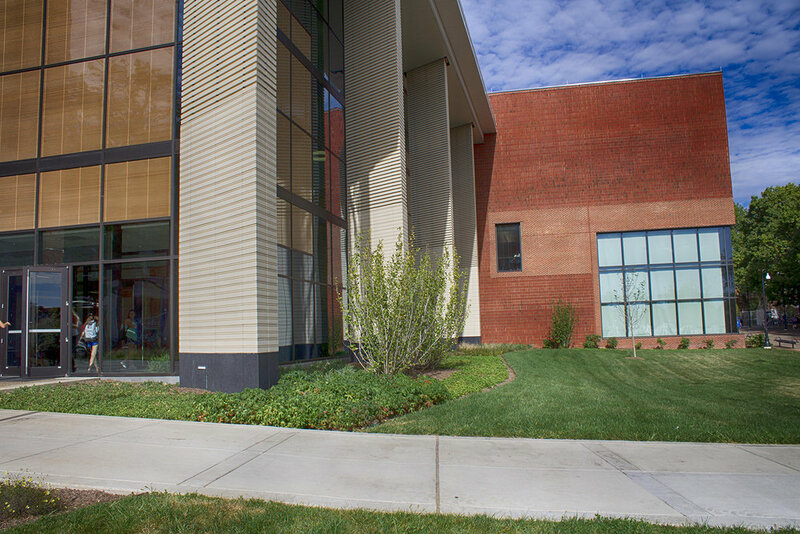 In the fall of 2016, the University of Kentucky unveiled a new state-of-the-art undergraduate science classroom, laboratory and research facility situated in the core of its Lexington campus. 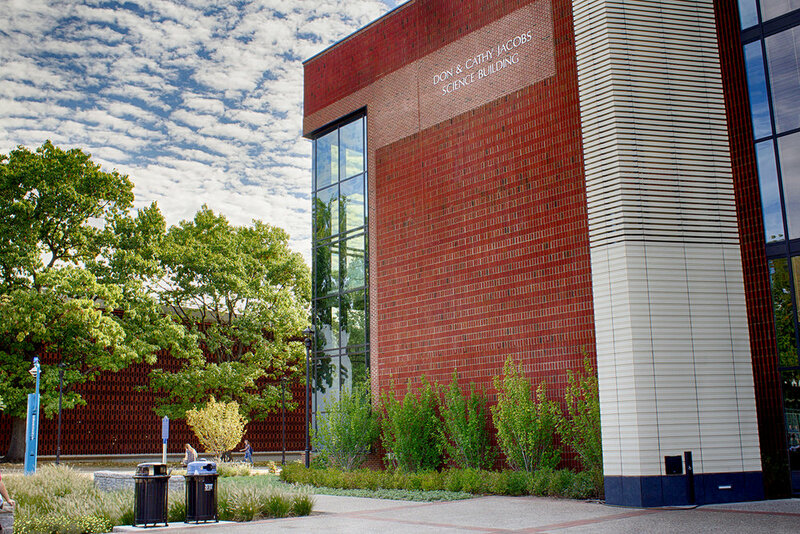 As a campus infill project, site design was a significant focus, as the University desired a strong connection between the indoor and outdoor educational spaces. An outdoor learning landscape introduces educational geological rock formations in the form of creative stone masonry walls. Igneous, sedimentary and metamorphic types of rock are used on the rear of actual slate chalk board walls. Seat walls display anticline and syncline formations, as well as normal, reverse and strike-slip faults. 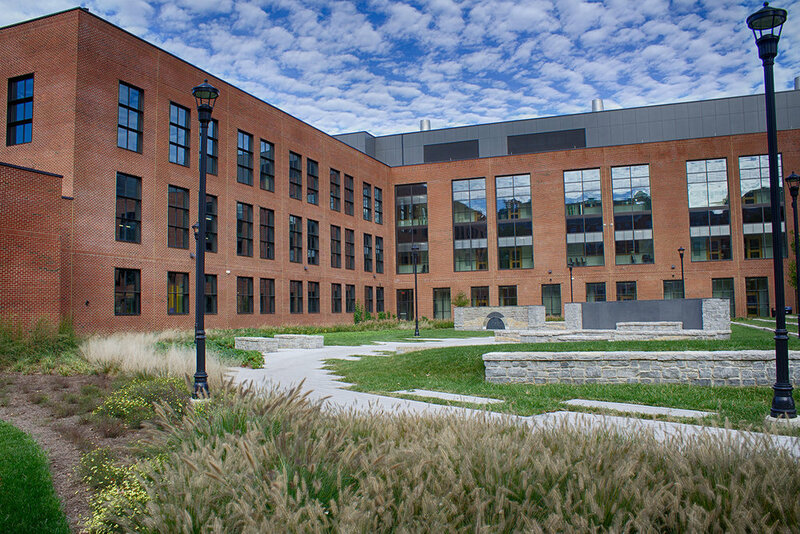 These walls comprise two outdoor classrooms that facilitate science classes in the courtyard, as well as exterior terraced seating areas for dining and socializing. 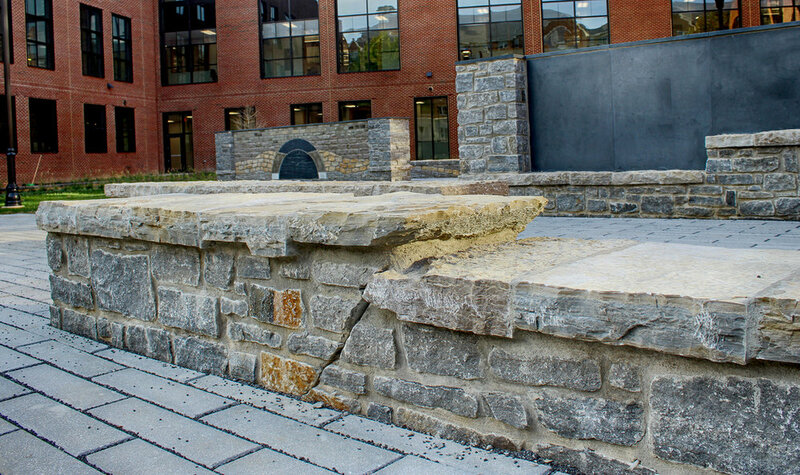 Rough cut segments of Kentucky River Marble are turned on edge to create a series of low terrace walls in a nod to the historical amphitheater behind the University’s signature Alumni Hall. Waves of indigenous plantings weave in and out of the building through the floor to ceiling glass façade, serving to satisfy the educational curriculum as well a unifying theme throughout the project. A rainwater harvesting system provides irrigation water for all of the exterior landscape plants while securing credits for the LEED silver certification. An underground detention basin beneath the courtyard mitigates the storm water runoff impact downstream where flooding has been a problem in the past.